Join our movement to hold the Democratic Party accountable for their racism—past and present. ACT NOW! Contact the biased journalist in the mainstream media and members of Congress. Demand an apology from the Democratic Party, the creators of the Confederacy, the Ku Klux Klan and the racial violence in Charlottesville. Below are links to articles with details. Why Stop at Reassessing Confederate Monuments? What About the Kennedy Brothers? If Confederate Statues Are 'Reprehensible', Why Didn't Nancy Pelosi Remove Them When She Had the Power as Speaker? House Minority Leader Nancy Pelosi woke up from her 30-year slumber last week and suddenly decided to be outraged by the Confederate statues standing in the halls of Congress. She finds them "reprehensible" and is demanding House Speaker Paul Ryan have them removed. Her family tree history makes her outrage a bit awkward. Red Alert Politics dug up a bit of history to find that Pelosi's own father, Thomas D’Alesandro, Jr., dedicated a statue to Confederate Gen. Robert E. Lee when he was the mayor of Baltimore. The monuments in Baltimore were taken down last week under the purview of current mayor Catherine Pugh. Now, Pelosi is demanding the statues in Congress have the same fate. She is also leading the charge to have President Trump censured his response to the white nationalist rally in Charlottesville. As Katie noted, if Pelosi can't bear to look at the Confederate monuments she's walked by for 30 years, then why didn't she have them removed when she was speaker of the House? Pelosi is not having a good August. 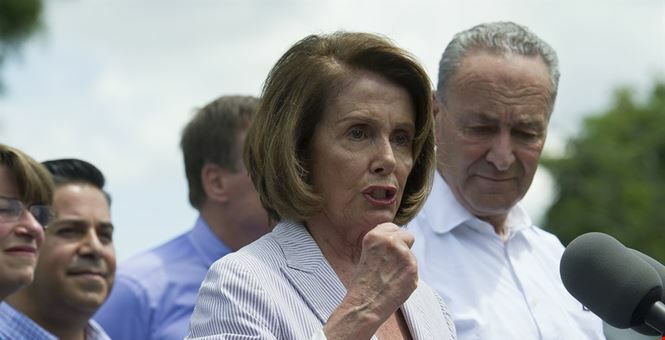 After drawing mockery for her delayed Confederate statue outrage, the minority leader was also exposed as a secret fan of single payer health care, and then forgot what was included in the Democrats' new 'Better Deal' agenda. She had to refer to a pamphlet. Horist: Why is Left Wing Violence Acceptable?